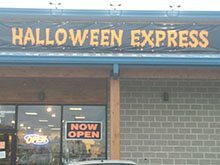 Halloween Halloween Express of Cedar Rapids, IA is excited to return for another great Halloween season in 2016. We will once again offer you the best and largest selection of costumes, decorations, masks, make up, wigs, props, and accessories anywhere in Cedar Rapids! We are excited for Halloween and you can count on us to continue to carry the best selection in costumes, decorations, props and accessories anywhere in Cedar Rapids, IA. We are located at 2445 Wiley Blvd. SW, Cedar Rapids, IA 52404(next to Toys R Us) at the intersection of Williams Blvd. and Wiley Blvd. SW. We are located in the Former Floor Trader building. We look forward to serving you again this season in the Cedar Rapids, IA area. Stop into Halloween Express, "Your One Stop Halloween Megastore." We are opening Sept. 9th! Stop by and see us!" Welcome to Halloween Express Quad Cities! We are back in Davenport, IA for the 2016 Halloween season. We will once again be carrying the largest selection of Halloween merchandise you'll find anywhere in Quad Cities area. We have two huge Halloween stores this year at the malls in Davenport IA and Moline IL. If you are looking for the newest and greatest you can find it at Halloween Express! Stop by our location in the North Park Mall across from Claire's or in South Park by J C Penny. We are locally owned and operated. Checkout our Facebook page for exciting new Halloween merchandise and special sales Halloween Express Quad Cities! Be anything you want to be at Halloween Express Des Moines, IA! Back for the 2016 Halloween Season we will again be the ONLY locally owned and operated Central Iowa's one stop shop for Halloween! Props, decorations, costumes, makeup, masks and wigs - you won't find a bigger selection than at Halloween Express Des Moines! We look forward to serving you again soon in the Des Moines, IA area and providing you great customer service. 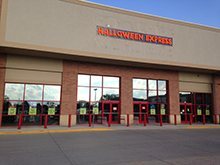 Be anything you want to be at Halloween Express West Des Moines, IA located in Water Tower Place in the old Sports Authority store next to Best Buy and Whole Foods! Back for the 2016 Halloween Season we will again be the ONLY locally owned and operated Central Iowa's one stop shop for Halloween! 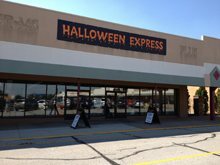 Props, decorations, costumes, makeup, masks and wigs - you won't find a bigger selection than at Halloween Express West Des Moines! We look forward to serving you again soon in the West Des Moines, IA area. Stop by soon for all your Halloween needs!